Whether you’ve clicked on this because you’re expecting your other half to pop the question, you’re the other half in question who is desperately scouring the internet for clues on how to find the ring that will elicit and instant ‘Yes!’ or you’re just curious, behold the most popular engagement ring as decreed by Pinterest. According to HelloGiggles, an extraordinary 63,000 pins have turned the 18k white gold, undeniably blingin’ diamond ring into the most sought-after gem on the social media pinboard. 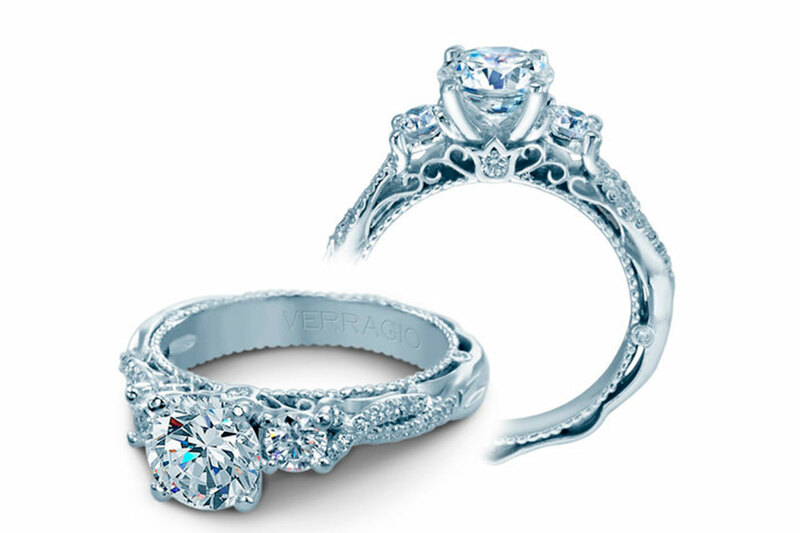 If you’re not au fait with diamond ring jargon, the intricacies of the design are a bit overwhelming. Not for the shy and retiring, it comes with 45 carats of brilliant diamonds, featuring a pave set diamond and lace embellishments. If that’s sold you, you can pick one up on Raymond Lee Jeweler’s website for about $4,300. Pinterest has become the mecca for brides-to-be (and aspirational brides alike), and just last week we discovered the most popular wedding dress was Australian label Grace Loves Lace’s Hollie 2.0 dress having been pinned more than 2.5 million times. Of course, choosing your own wedding dress is a completely different ball game to buying an engagement ring for someone else. The best advice we can give is to take cues from her (or his) wardrobe and the jewellery she wears. Does she favour classic fashions, minimalist jewellery, label-heavy handbags or bold avant-garde jewels? Make sure it complements her tried-and-tested favourites and you’re on to a winner. A ring is a big purchase and luckily, some jewellers will actually offer discounts – so keep an eye out! A great resource is our Black Friday engagement ring sales guide, which we’ll be updating as and when the best bargains roll on in. If you’re looking for something custom-made, choosing the right jeweller is also an important point to bear in mind. With so many to choose from, the differences may seem minuscule but before you take the plunge on this big purchase, do your research. The most important thing is to make sure you read the jeweller’s return policy inside out, just on the off chance that she doesn’t like it.